Skip content and go to navigation. Fly fishing tuition and guiding in the heart of Devon with Richard Jackson. Holder of the Level 2 CCA (certificate in coaching, licensed coach) in game angling, and game angling instructor's certificate. Join me in the county of Devon and fly fish some of the best wild brown trout rivers in the South West, including the Rivers Teign and Dart which tumble down off Dartmoor, and the Yeo and Creedy which are tributaries of the River Exe in Devon which all offer superb fly fishing opportunities. 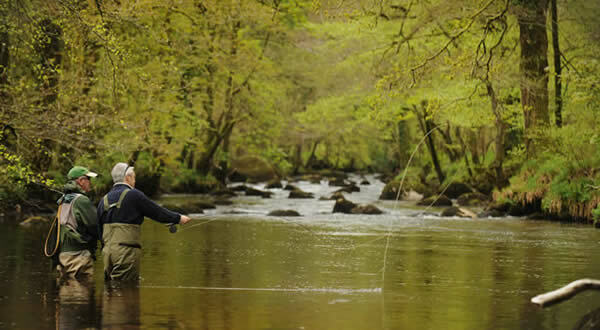 Sea Trout fishing on the Upper River Teign set in a spectacular wooded gorge within the Dartmoor National Park, Devon. Fly fish on my local Devon reservoirs, Kennick, Fernworthy and Roadford for Rainbow Trout and Brown Trout. If you require the latest fly fishing report on any Devon county reservoir please feel free to contact me. Thanks for visiting my web site, within the site you will find all that you require should you be looking for some professional fly fishing instruction or an experienced fly fishing guide for Wild Brown Trout or Rainbow trout in the beautiful county of Devon. I am based 10 miles west of Exeter in the county of Devon, which has its own international airport, this is situated approximately 6-miles from the city centre and 30 minutes away from my base in mid Devon. The city is also very well served by all major road and rail links, I am 15 minutes away from Exeter St David's Station. You can be fly fishing in Devon with me on a Dartmoor river or lake within an hour of your arrival! We can put together a fly fishing course in Devon based on your own individual requirements, imagine learning to fish on a lake one day, then the following day you can be casting your fly in a river to a wild brown trout, it doesn't get any better than that. Why not give a unique fly fishing present, see my fly fishing gift voucher page for further details, not something you can buy in any shop! The gift vouchers make excellent Fly Fishing Christmas presents or birthday presents. These can be redeemed against any service I provide, be that fly fishing instruction or the recipient is in need of a fly fishing guide, an original present for that person who already might have it all. Or against any equipment I sell, take a look at the fly fishing equipment I sell on my equipment page which includes a top quality fly fishing rod and more! Come and join me in Devon for the fly fishing experience of a lifetime and get hooked! Experienced fly fishing on some of the south west best rivers for trout. Copyright © Devon Flyfisher. All Rights Reserved.